2. To make the slaw, place the cabbage, onion and carrots in a bowl and add the vinegar and sugar. Leave for 20 minutes. 3. To make the tzatziki, mix together all the ingredients, adding a splash of cold water if too thick. 4. 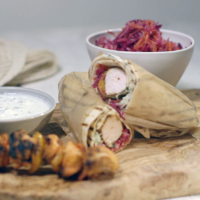 Wrap the kebabs in the tortillas or flatbreads and serve with the tzatziki and slaw.